Ladbrokes have to shell out a few readies to the lucky dweller from the Rebel County. 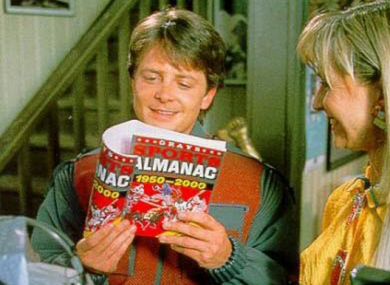 Mart McFly with the [now out of date] Gray's Sports Almanac. PAUL CASEY WAS not the only man to holler with delight last weekend after his Irish Open win at Carton House. One lucky punter placed €60 on Casey to win the Irish Open and Bill Haas to capture the AT&T National in America. Considering that Casey had been winless for two years and Haas was 24th on the PGA money list, the gamble, which came in at odds of 317/1, was certainly a hopeful one. The Cork customer placed his bets in Ladbrokes on Marlboro Street having €10 each way on American Bill Haas at 40/1 for the AT&T National title, who delivered with a three-stroke victory. He put €10 each way on Casey for the Irish Open at the same price, who also landed the spoils by three strokes, and finally placed a €10 each way double on the pair. The two single bets returned €520 each while the returns from the each way double amounted to €18,020. The customer, who staked a total of €60 will be collecting €19,060 from Ladbrokes. The only logical explanation for this is that Biff Tannen has travelled back to Cork, from 2015, with his sport almanac and placed some unlikely bets to fund a lavish penthouse suite in a downtown hotel. Email “Lucky Cork punter wins €19k after €60 bet on two golfing outsiders”. Feedback on “Lucky Cork punter wins €19k after €60 bet on two golfing outsiders”.